Shopping for a new vehicle to either purchase or lease can be a really overwhelming experience. This might be your first vehicle that you are looking at or you may have had numerous other vehicles before. Regardless, there is a lot to consider and you owe it to yourself and your budget to gather as much knowledge as you can before making a final decision. When it comes to Hyundai vehicles, you get a lot for your money. The Accent is a vehicle that brings power, safety and great interior features to the table. You will be hard pressed to find something that compares. The Accent comes standard with a 1.6-liter engine that allows for 130 horsepower. When it comes to fuel efficiency, you get thirty-two miles per gallon combined; one of the highest ratings on the market right now. 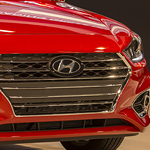 Stop down to Spokane Hyundai to find out more about the Hyundai Accent.